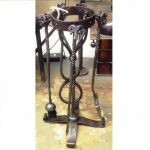 This fire tong was made on the forge, here at Allerford Forge Blacksmithing. The tongs are finished with a traditional beeswax finish, which was sourced locally. This style of fire tong was made on the forge, here at Allerford Forge. The tongs are finished with a traditional beeswax finish, which was sourced locally. The pictured set of tongs stand at 670mm in height poker. The pictured represents the item, the item received may slightly differ as each item is handmade and we aim to make and send the fire tongs within five working days.